Don’t see your answer here? No problem! We’d love to answer via email. How does a patient choose the right surgeon? It is important for you to know the right questions to ask at your visit with a surgeon. First and foremost, we believe the experience of the surgeon is directly related to the risks of thyroid and parathyroid operations. Please ask your surgeon how many thyroid and parathyroid surgeries they perform weekly. It is well known in surgery the higher number of thyroid and parathyroid surgeries done by a surgeon results in fewer complications, with usually 100 of these cases per year being a minimum needed to be considered “high-volume”. Ask your surgeon if they are sending thyroid biopsies for genetic testing! See our genetic section on the home page to find out why this is so important! This is the most important question to ask your surgeon!!! Also, please ask if they use numbing medicine during the biopsy as these can be uncomfortable with out it. At Austin Thyroid and Parathyroid Surgeons, we take the time to use local anesthesia or numbing medicine for the skin to make it as painless as possible. If they do not take the time to use local anesthesia, we will! Do they concentrate on only thyroid and parathyroid operations or do they spend time doing many other types of surgeries, such as abdominal cases, breast surgery, or bariatric operations? It is also imperative to ask the surgeon how many complications from neck dissections for thyroid cancer surgeries that they have had in the past…ask about hematomas (bleeding in the neck after surgery), need for tracheostomy (breathing tube placed surgically after thyroid surgery), thoracic duct (lymph node injury which requires drains and multiple days in the hospital), nerve injuries (including the nerve innervating the lip), vocal cord injury. Take note if the surgeon tells you that you will likely be in the hospital for more than one night for thyroid surgery (even with a neck dissection)…this is a concern since patients that are doing very well after surgery can go home earlier. All of our patients go home within 24 hours of their operation! Austin Thyroid Surgeons has NOT had any of these complications! We are tracking our data, ask for this when you see a surgeon! If a patient has thyroid cancer, ask the surgeon which lymph node levels they will be removing at the time of the cancer operation. There are actually 7 different levels of lymph nodes on each side of the neck, so that means 14 total in the entire neck. It is important for your surgeon to know which levels on which side may need surgery and when it is appropriate to operate on them. This is big procedure, but Dr. Sabra and Dr. Brady still are able to minimize scarring by limiting the skin incision on the neck. We have also limited the use of drains and the time in the operating room under anesthesia since you will have 2 (two) EXPERTS doing your surgery. Do they try to preserve as much of the thyroid gland as possible? The vast majority of thyroid cancers are not aggressive and only require partial or hemi-thyroidectomy. If your surgeon is recommending total thyroid removal, please get a second opinion from our team. This is NOT indicated in most patients, even with thyroid cancers. How many thyroid and parathyroid surgeries do they do per week? per month? per year? It’s important to know that complication rates are directly related to surgical volume! Austin Thyroid and Parathyroid Surgeons perform on average 10 thyroid and parathyroid cases per week, that is over several hundred per year! Please find out how long you will be under anesthesia, this is extremely important as there are risks associated with prolonged general anesthesia. Since you will have 2 EXPERTS, our surgeries take less time, are less painful and have fewer complications. This is based on our data! The majority of our parathyroid cases are approximately 20-30 minutes and thyroid cases are approximately 60 minutes. Of note, complex thyroid neck dissections can take a couple of hours. How many years have they been specializing in and focusing on only endocrine surgery (thyroid and parathyroid)? 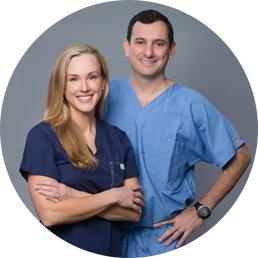 Dr. Sabra and Dr. Brady have been specialists in the field for over 15 years in Austin, Tx. Do Dr Brady and Dr Sabra always evaluate all four parathyroid glands during minimally invasive parathyroidectomy (MIP)? YES! They will ALWAYS look at all four glands, but remove only the abnormal parathyroid adenoma. The reason to look at all four glands is that up to 15% of patients can have “double adenomas” or more than one abnormal parathyroid gland. If other glands appear abnormal, Dr. Brady or Dr. Sabra will perform a biopsy of them and send the sample to the pathologist. If the intraoperative pathology confirms hypercellular (too many cells) parathyroid tissue, she will remove the gland. If not, Dr Brady or Dr Sabra will preserve it. How do I know if I will need thyroid or parathyroid surgery? Thyroid nodules (growths in the thyroid gland) are extremely common. The majority of these lesions are benign (not cancer). However, the thyroid gland can develop nodules or lesions that may require removal by a thyroid surgeon. Some of these nodules can be cancerous and need to be removed. To evaluate if a nodule could be cancerous, we often recommend an FNA (Fine Needle Aspiration) biopsy. If an FNA biopsy reveals benign tissue, patients can be followed conservatively (without thyroid surgery). At times, patients may experience symptoms from even benign nodules. These symptoms can include difficulty swallowing or breathing, a choking sensation, or the feeling that something is stuck in their throat. On occasion, patients can have voice hoarseness as a thyroid nodule or goiter enlarges and begins to push on the windpipe, vocal cords, or esophagus. We refer to these as compressive symptoms and these symptoms may become severe enough that we recommend surgery. The parathyroid glands are not related to thyroid function at all. The name “para” thyroid simply comes from the fact that they are near the thyroid gland and share some of the same blood supply as the thyroid. They are primarily involved with regulating calcium levels in the body. Whereas the thyroid gland is important for metabolism and can affect the function of all organ systems in the body. At times, the parathyroid glands can grow and produce too much parathyroid hormone (PTH) in the body. This overproduction inappropriately pulls calcium out of the bone and puts it into the blood stream. This can cause patients to have a number of symptoms such as lethargy, problems with concentration, memory loss, depression, high blood pressure, heart problems, kidney stones, and osteoporosis. The presence of some of these symptoms combined with either an elevated PTH and/or calcium level means that a patient may require parathyroid surgery. At times, patients have a normal calcium level and an elevated parathyroid hormone level. Other times, patients can have an elevated calcium level and normal parathyroid hormone levels. Both of these groups of patients still have primary hyperparathyroidism and will require parathyroid surgery. In my experience, patients feel much better after parathyroid surgery to remove their abnormal gland or glands. Many patients have told me it was “life changing” for them, giving them an increased energy level and improved cognitive function. What is an FNA biopsy of the thyroid, parathyroid, or lymph node? How is it performed? An FNA biopsy or fine needle aspiration is a sample of tissue that is obtained with a very small needle taken using ultrasound guidance that the pathologist can evaluate. Dr. Brady and Dr. Sabra, local thyroid and parathyroid surgeons in the Austin area, perform these if indicated in their offices at the initial consultation with their thyroid and parathyroid patients. After identifying the lesion or lesions to be sampled, they will prep or clean the skin on the neck and inject some local anesthetic or numbing medicine. With the ultrasound guiding them, they advance the needle in the numb area into the nodule that needs to be sampled. They then prepare several slides for the pathologist to study under the microscope. This procedure is extremely important for determining if thyroid nodules are benign (non-cancerous) or malignant (cancerous). Dr. Brady and Dr. Sabra usually take 10-15 minutes to perform these biopsies. The FNA biopsy is helpful in sampling lymph nodes for metastatic disease also. The patient can go back to work and drive home after the procedure. Dr. Brady and Dr. Sabra will recommend ice packs to be used for minimizing swelling and soreness after the biopsy. Within 48-72 hours, they will obtain a result from the pathologist and will call the patient with results and a plan for the patient. When do Dr. Brady and Dr. Sabra recommend an FNA biopsy of a thyroid nodule? Usually any thyroid nodule that measures 1cm or greater needs an FNA biopsy to ensure it is benign and can be followed without a thyroid surgery. If a nodule has suspicious features such as increased blood supply, irregular borders, calcifications, signs of enlargement or the patient has a history of radiation exposure to the neck, Dr. Brady and Dr. Sabra, two of Austin’s finest local thyroid and parathyroid surgeons, always recommend an FNA biopsy. In these cases a biopsy is required even if the nodule is less than 1cm. Another group of patients that will likely need an FNA biopsy of thyroid nodules are those with a personal history of any cancer or family history of thyroid cancer. It is rare, but some other types of cancer can metastasize to the thyroid gland with the most common being kidney, breast, lung, gastrointestinal tract or melanoma. What is a neck ultrasound for the thyroid? A neck ultrasound is a radiologic examination of the neck that uses sound waves (not radiation) to evaluate the size of the thyroid and the presence of nodules or lymph nodes in the region of the thyroid. A thyroid ultrasound is painless, noninvasive, and inexpensive. If they are enlarged, parathyroid glands can also be seen on an ultrasound. Typically, thyroid nodules over 1 cm need to be biopsied to ensure that they are benign. Certain nodules like cystic (fluid filled) lesions are almost always benign and can be followed without surgery. These cystic nodules can be aspirated (drained) to decrease size if they are causing any symptoms such as compression or pain. They may need a FNA biopsy if they are complex (have solid and cystic areas). Lymph nodes that appear suspicious with areas of calcifications, loss of normal appearance, enlargement, or increased blood supply may also need a biopsy. What is a sestamibi or parathyroid scan? Thyroid and parathyroid surgeons might order this scan or X-ray to help identify abnormal or enlarged parathyroid glands. It is not used for diagnosing hyperparathyroidism, but mainly for surgical planning, and is accurate in about 80% of cases. The thyroid and parathyroid glands have a strong affinity for the sestamibi(radiotracer) that is injected and with time the thyroid loses or washes out the sestamibi. The parathyroid glands hold onto the tracer longer, especially if they are enlarged or abnormal. Over a span of about 2 hours, photos or X-rays are taken to evaluate the patient for parathyroid disease. This helps determine which of the 4 parathyroid glands is hypercellular or enlarged. When a single gland is identified on the parathyroid scan, Dr. Brady and Dr. Sabra, with 10 years of experience in the Austin area, offer the MIP (minimally invasive parathyroidectomy) for patients and it is done on an outpatient basis. It is also helpful in identifying ectopic parathyroid glands or those that are not in the normal anatomic positions. Some of these glands can even be in the chest, upper neck, or next to the esophagus. What if my sestamibi scan is normal or negative for any abnormal parathyroid glands? If a parathyroid or sestamibi scan is normal, it does not mean that a patient does not have a parathyroid problem. Thyroid nodules, thyroid cancers, and Hashimoto’s thyroiditis can all cause a scan to be inaccurate or not show the abnormal parathyroid gland. Some may also have multiple (more than one) abnormal parathyroid glands occurring in 15%-20% of patients with hyperparathyroidism. Also, if a patient has had prior thyroid or parathyroid surgery, their scan can be negative. 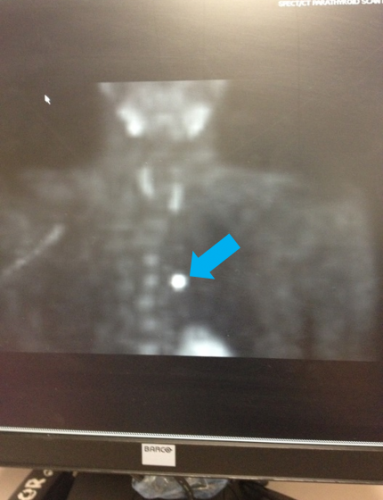 Finally, the patients with small abnormal parathyroid glands cannot always be seen on X-ray. What is a SPECT scan? What is a 4D CT scan of the neck? This is a sestamibi scan with single photon emission computed tomography (SPECT), or basically a CT scan of the neck using sestamibi tracer also. A 4D CT scan of the neck is a detailed computed tomography with use of IV contrast or dye with the 4th dimension being time. It can help identify a lymph node from a parathyroid gland by monitoring blood flow in real time. Why did my thyroid or parathyroid doctor order a 24-hour urine calcium level? This test can confirm primary hyperparathyroidism from a rare inherited disorder known as Benign Familial Hypocalciuric Hypercalcemia or BFHH. Patients with this disorder have a long history of high blood calcium levels and a family history of elevated calcium levels. It is important to rule this out as these patients do not benefit from surgery. Patients with high 24-hour urine calcium levels (>100 mg/day) have primary hyperparathyroidism and those with low urine calcium levels (‹100 mg/day) have BFHH. How long is thyroid or parathyroid surgery? What does it entail? This depends on the skill of the thyroid surgeon, the type of surgery being performed, and the severity of the disease. In the hands of experienced surgeons like Dr. Brady and Dr. Sabra, a thyroid lobectomy (partial thyroid removal) typically takes about 45 minutes to one hour. A total thyroidectomy can take about 45 minutes to 90 minutes depending on the degree of difficulty of the operation and whether lymph nodes are removed at the same time. Minimally invasive parathyroidectomy (MIP) is shorter, usually lasting only about 20 minutes if the diseased gland is localized or slightly longer if Dr. Brady or Dr. Sabra needs to visualize and evaluate all 4 glands. At times, parathyroid surgeries can last longer, especially for reoperations or if the diseased gland is not in the suspected location. All of these surgeries require a general anesthetic, meaning that a patient is given a sedative to put them to sleep. A breathing tube is placed by an anesthesiologist, who monitors the patient throughout the procedure. Patients typically spend 1-2 hours in the recovery room and then will be either discharged home or admitted overnight to the hospital. The great majority of patients undergoing a partial thyroid removal or parathyroid surgery do not have to stay in the hospital overnight. If a patient has a total thyroidectomy, Dr. Brady or Dr. Sabra will determine whether they require a hospital stay. Many patients having a total thyroidectomy have been able to go home on the same day as surgery, therefore avoiding an overnight hospital stay. What is a minimally invasive radioguided parathyroidectomy or MIRP? This type of parathyroid surgery involves an injection with a radioactive substance called sestamibi (radioisotope technetium-99m) by the radiology department before surgery. The sestamibi tracer will be taken up quickly by the thyroid and parathyroid glands. Over time, the thyroid loses or clears the tracer before the parathyroid glands. If a patient has an enlarged parathyroid gland, it will hold onto the sestamibi even longer and therefore can be picked up by a probe in the operating room. Once the enlarged parathyroid is removed, Dr. Brady or Dr. Sabra can get a count (or level) of radioactivity compared to background tissue. It can help thyroid surgeons detect locations of parathyroid lesions that may be hard to find. For example, if a patient requires a reoperation for a failed parathyroid surgery or if the parathyroid gland is found to be ectopic (not in its normal anatomic location), this type of procedure is extremely helpful. Dr. Brady and Dr. Sabra, who specialize in thyroid and parathyroid operations, use this type of injection selectively as it is may not be needed in straightforward cases where the adenoma is seen well on parathyroid scan prior to surgery. It can carry an added cost to the patient and their procedure. Is thyroid or parathyroid surgery painful? Neck surgery in general is considered to be minimally painful. That being said, Dr. Brady or Dr. Sabra injects local anesthesia for every patient to ensure adequate pain control after thyroid and parathyroid surgery. They also prescribe pain and nausea medications to use at home as needed. Additionally, it is fine to take Tylenol, Motrin, or ibuprofen postoperatively to improve comfort and decrease inflammation. What are the risks of thyroid or parathyroid surgery? There are 2 main risks of thyroid and parathyroid surgery that a surgeon should discuss with any patient that is preparing for a thyroid or parathyroid operation. The risk of permanent recurrent laryngeal nerve injury is approximately 1% in the hands of experienced thyroid or parathyroid surgeons like Dr. Brady and Dr. Sabra. This type of injury causes hoarseness of the voice and can be temporary or permanent. Temporary hoarseness occurs about 20% of the time and takes anywhere from a few days to several months to resolve completely. There is also a risk of injury to the external branch of the superior laryngeal nerve that can result in loss of tone in the voice or inability to yell or sing. Dr. Brady and Dr. Sabra use a nerve monitoring system to identify, protect, and evaluate these nerves during every thyroid and parathyroid operation. Another risk of thyroid surgery is injury to or inadvertent removal of normal parathyroid glands. In the hands of an experienced thyroid or parathyroid surgeon, that risk is about 2% or less. The parathyroid glands control calcium metabolism in the body, which can lead to problems with muscle contraction. This type of complication can be temporary or permanent. If this occurs, patients can become hypocalcemic (low blood calcium levels) and may require daily calcium supplements. To an inexperienced surgeon, parathyroid glands can be very difficult to differentiate from the surrounding tissue. The way the parathyroid gland feels to touch and looks under magnification is critical in differentiating parathyroid tissue from its surrounding tissue. This is where Dr. Brady and Dr. Sabra’s years of experience and expertise become critical to the success of the operation. Having done hundreds of thyroid and parathyroid surgeries over the past 10 years in practice in Austin, Texas have given them the ability to identify subtle differences between parathyroid tissue and its surrounding tissues, such as fat or lymph nodes. They also routinely takes the specimen to the pathology department and look under the microscope with the pathologist to ensure adequate and successful surgery is done. Normal parathyroid glands must be preserved and not removed as inadvertent removal can require life-long daily calcium supplementation. What are the symptoms of low calcium after thyroid or parathyroid surgery? A temporary drop in the calcium level is not uncommon after thyroid and parathyroid surgeries. Symptoms can include tingling or numbness in the fingers, toes, or around the mouth. These symptoms result from increased neuromuscular irritability. In more severe cases, patients can experience muscle spasms, muscle aches or stiffness. If any of these symptoms occur, one should contact their thyroid surgeon or parathyroid doctor immediately. How long do I need to take calcium after thyroid or parathyroid surgery? I recommend that all of my patients having a total thyroidectomy or parathyroid surgery take calcium by mouth daily for approximately one week after their thyroid or parathyroid surgery. Usually, I ask them to take Tums or any calcium pill (750-1000 mg every 8 hours). This helps to prevent the symptoms of low calcium that can occur after any thyroid or parathyroid surgery. At times, thyroid surgeons will also prescribe Rocaltrol (calcitriol), a prescription form of vitamin D that helps with calcium absorption in the intestine. How long will my incision or scar be? For the majority of Dr. Brady and Dr. Sabra’s surgeries, they prefer the minimally invasive approach. Dr. Brady and Dr. Sabra take their patients’ surgeries very seriously, and on occasion, they team up with Dr. Jennifer Walden, a renowned plastic surgeon in Austin, Texas. Thyroid and parathyroid surgery should never be compromised by the incision length. At times, depending on the size of the thyroid or parathyroid, they may have to enlarge the incision slightly to perform safe surgery. Their standard thyroid lobectomy or complete thyroidectomy incision is 4 cm or less. That is less than 2 inches. The incision for minimally invasive parathyroidectomy is 2 cm or less, smaller than 1 inch. Dr. Brady and Dr. Sabra ALWAYS hide the incision in a natural skin fold of the neck so that the scar is barely visible once it is healed. They have performed a number of reoperations on the neck in patients with disease recurrence after unsuccessful surgery performed by other parathyroid doctors. They will typically use the same incision site and revise it to improve patient’s cosmetic outcome. How do I protect my scar after thyroid surgery? For the first 24-48 hours after surgery, ice packs are recommended to the neck wound and limitation of heavy lifting or exercise for about 5 days. Our patients may resume normal daily activity the day after surgery if there are no issues. We allow our patients to shower the next day and get the wound wet. If the patient has steri-strips (white strips) placed on the wound, these usually stay in place until the postoperative visit with me at about 10-14 days. We will remove these strips at that visit. Some patients have Dermabond (surgical glue) placed on the wound and this will usually stay on for 2-3 weeks. After the postoperative visit, we recommend daily sunscreen application to the wound every morning for 6 months. Zinc oxide is preferred. The other option is to avoid sun exposure, but many find that nearly impossible in the beautiful city of Austin, Texas! In the evening, a scar prevention cream (such as Mederma or any generic equivalent) can be applied to prevent further scar formation. We also recommend daily multi-vitamins as they will assist with wound healing and scar prevention. When do I need to start thyroid replacement hormone? Thyroid replacement hormone can be started within a few weeks after a patient has had the entire thyroid gland removed. Typically, an endocrinologist, primary care physician or ob-gyn doctor will monitor thyroid hormone levels and prescribe thyroid hormone replacement as needed. If only half of a patient’s thyroid is removed, the patient will need thyroid function tests performed about 6-8 weeks after their thyroid surgery or earlier if they are experiencing symptoms of hypothyroidism (low thyroid). Approximately 80% of our patients don’t require thyroid replacement hormone after a partial thyroidectomy or thyroid lobectomy. Can I take thyroid hormone replacement when I am pregnant or trying to become pregnant? Thyroid replacement hormone is completely safe and important to take if one is pregnant or trying to become pregnant. Thyroid hormone is essential for proper fetal thyroid development as it crosses over the placenta to the baby. Adequate thyroid hormone levels are most critical during the early weeks of gestation, but a patient’s thyroid hormone requirements can often increase as the pregnancy progresses or if the patient is pregnant with multiples. Patients need to let their doctors know that they are taking thyroid replacement at the initial visit so that their thyroid levels can be followed regularly and their dosage of medication adjusted as needed to ensure a healthy pregnancy. How will my life change after thyroid surgery? Patients do very well after thyroid surgery and usually don’t need to take thyroid hormone unless the entire thyroid gland is removed. Usually a patient has their thyroid function checked several weeks after the operation to ensure that the remaining thyroid is producing adequate amounts of thyroid hormone for the body. Depending on their thyroid levels and how they are feeling, patients may need extra thyroid hormone. In our experience, patients that are followed by their physicians regularly do not experience any weight gain or other symptoms of hypothyroidism (low thyroid). If a patient has complete removal of the thyroid gland, they will be required to take a thyroid pill everyday to maintain their metabolism. Those diagnosed with thyroid cancer typically have excellent long-term survivals rates of 97-98%. Will I need radioactive iodine treatment after my thyroid surgery? Thyroid cancer is primarily treated with surgery. At times, radioactive iodine is needed after a thyroid operation. Most times, an endocrinologist and the thyroid surgeon determine whether a patient needs radioactive iodine by evaluation of the pathology report. Radioactive iodine can be recommended for certain patients depending on the size of the thyroid tumor or if the patient has extensive disease involving lymph nodes or growth beyond the thyroid gland. This treatment is given in a pill form several weeks after thyroid surgery and does require specific protocols on administration. Radioactive iodine will kill any remaining microscopic thyroid cells in the body that might be remaining. Will I need an oncologist or chemotherapy if I am diagnosed with thyroid cancer? An oncologist is not necessary with a diagnosis of thyroid cancer and this type of caner is not sensitive to chemotherapy. Typically an endocrinologist and an endocrine surgeon follow a thyroid cancer patient over the long term. They will see the patient regularly and obtain thyroid ultrasounds and blood work to make sure the thyroid cancer has not recurred or come back. One blood test they follow is a thyroglobulin level (a test for thyroid tissue present in the body.) After a complete thyroidectomy and lymph node excision, the thyroglobulin level should be zero since there is no longer thyroid tissue in the body. If the number increases, the thyroid surgeon or endocrinologist will obtain a thyroid ultrasound and thyroid scan to look in the body for where the thyroid tissue or cancer has come back. If it comes back in lymph nodes in the lateral neck (most common scenario), the patient will need a lateral neck dissection and Dr. Brady or Dr. Sabra, local thyroid and parathyroid surgeons in the Austin area, can perform this surgery to remove the lymph nodes in this area. What is laryngoscopy? When would a thyroid patient need it? Laryngoscopy is a procedure where a doctor inserts a scope into the patient’s nose and advances it into the back of the throat to visualize the vocal cords. This can be done in the office or the operating room. Dr. Brady and Dr. Sabra do not believe every thyroid patient needs a direct laryngoscopy and they only recommend this procedure to certain thyroid patients as it is an added cost and can be uncomfortable for the patient. The patients that would need laryngoscopy are those that have had prior thyroid, parathyroid or other neck surgery. Also, patients that have recent hoarseness from enlarging thyroid nodules or an aggressive thyroid cancer need laryngoscopy. Recent data out of Japan was presented at the American Association of Endocrine Surgeons meeting in 2014 demonstrating that ultrasound can be used to visualize the cords accurately and without any added cost or discomfort to the patient. This can be done when a thyroid patient is seeing Dr. Brady for the first time in the office. What labs will be important to order? Dr. Brady and Dr. Sabra will order certain lab levels on every thyroid and parathyroid patient. The reason for this is that these patients commonly have problems with both organs. They feel that if they have problems with both, these can both be addressed in the same operation. The labs that they check routinely are calcium levels, parathyroid hormone (PTH) level, thyroid stimulating hormone (TSH) level, free T4 (thyroxine) level, and a vitamin D level. Is it important to follow up after a diagnosis of thyroid cancer? If a patient is diagnosed with thyroid cancer, long-term surveillance is essential. Patients with thyroid cancer are typically followed at least yearly with ultrasounds, thyroglobulin, and thyroid stimulating hormone (TSH) levels. The main treatment for thyroid cancer is SURGERY, but sometimes a patient will require radioactive iodine to burn tiny thyroid cancer cells that might still be present in the body. This radiation treatment is actually offered in a pill that the patient swallows. After the entire thyroid and lymph nodes nearby are removed, a patient must be on thyroid replacement hormone for life to maintain their normal metabolism. The goal of this medical therapy for thyroid cancer patients is to keep the TSH very low or suppressed so that the thyroid cancer does not return or keep the few cancer cells that may be still in the body from growing or dividing. We follow thyroglobulin levels as a marker for possible thyroid cancer recurrence. What is genetic testing for thyroid nodules? Do I need to have this performed on my biopsy? Who performs this test? Genetic testing is one of the newest tests that can be performed on thyroid nodules. It is important since it can help determine whether a nodule in the thyroid is at risk for being a cancer. Many FNA (fine needle aspirate) biopsies come back with follicular cells that are the normal cells that make up the normal thyroid gland. Sometimes it is impossible for any pathologist to tell the difference between benign or cancerous follicular cells. This is how the genetic test on the FNA cells becomes key. If the FNA biopsy with the gene test comes back benign (and other things such as the ultrasound, exam, and family history are not suspicious for a cancer), then normally a patient would NOT need to have thyroid surgery or removal of a portion of the thyroid gland. This is what happens the majority of the time when such testing is done. In the past, patients who had follicular cells on an FNA biopsy were advised to have their thyroid removed, since the pathologist would not be able to definitively rule out cancer. Now some of these same patients can be safely followed without surgery, and instead doing close follow up with physical exams and neck ultrasounds by their thyroid surgeon or endocrinologist. However, not all surgeons perform this type of biopsy so it is very important to ask your surgeon if they do the genetic testing for thyroid nodules (such as the AFIRMA biopsy). In our practice, the number of patients requiring surgery for benign nodules has decreased since we began the use of biopsies with genetic testing. It is the most accurate method we presently have to assure these patients that they do not need surgery. As more patients and the general public learn more about the thyroid and the multiple options available for care, many are requesting this genetic test to be performed at the time of their FNA biopsy. Does Austin Thyroid Surgeons offer the genetic test for the thyroid FNA biopsy? Yes, both Dr. Brady and Dr. Sabra can perform this type of FNA biopsy by Afirma even on the first office visit along with a neck ultrasound. In fact, both of these doctors are on the Speaker’s Bureau for Afirma and presently speak to local doctors and other medical professionals to inform them about this genetic biopsy as an option for their patients. How long after the thyroid FNA biopsy is performed are genetic results completed or available? The pathologist begins with the testing by examining the thyroid cells from the FNA biopsy. If they recommend further genetic tests to be completed on the cells, they are then sent out for the special genetic testing. It might take up to 10-14 days after the biopsy was performed to get the completed results because of the advanced nature of the testing. What is robotic thyroid surgery? Robotic surgery of the thyroid is typically performed through the axilla (underarm area) with use of a robot to avoid a neck scar. The scar is instead located under the arm, but it does carry some increased risks (such as blood vessel and nerve injury, and esophagus injury) and many patients are not considered candidates for the operation. This type of procedure is currently not considered the standard of care in the United States, and presently Austin Thyroid Surgeons does not offer robotic neck surgery for this reason. Trans-oral thyroidectomy is removal of the thyroid gland from the mouth or below the lower lip, and is requested by some patients to avoid having a scar on their neck. This technique uses specialized video-instruments, and it is performed while the surgeon views it on a screen. This is a very new technique, and only certain patients are candidates for this type of operation. It is not recommended for larger thyroids or most cancer cases. What is Thyroid Ablation and how do I know if I should have it done? Thyroid Ablation is the process of injecting thyroid cysts nodules with alcohol to actually kill the cells that are creating the nodules. It is usually done using a neck ultrasound and a small needle in the clinic. Ablation can also be done using laser machines or other electrical energy equipment. There are certain scenarios where smaller benign nodules or cysts are candidates for ablation techniques instead of surgical removal. Observation of these same nodules without any intervention can also be an option, so it is important to discuss all of the options with your endocrinologist and endocrine surgeon. There may be a time in the future when ablation techniques become a standard treatment approach for many nodules, although we are not there yet. What does the thyroid look like on ultrasound? Your thyroid has 2 lobes, one on the left and one on the right, and they are usually symmetric. 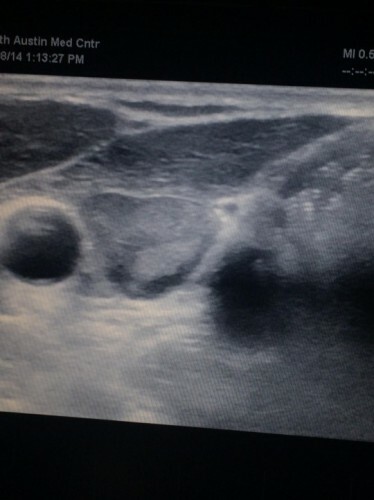 A normal thyroid gland appears uniform throughout, with all of the areas appearing to have the same color and density on the ultrasound screen. If the ultrasound does not appear uniform then it may be that there are nodules present in the gland. The majority of thyroid nodules are benign, and they can appear as solid, cystic (fluid filled) or complex (combination of solid and cystic). These nodules can have smooth (less suspicious) or irregular borders (more suspicious), and these characteristics along with others help your doctors determine if a nodule needs to be biopsied. Why is getting an ultrasound so important before going to surgery for thyroid disease? Obtaining a thyroid ultrasound before any surgery is recommended by the ATA (American Thyroid Association) as an integral part of patient care, which includes determining the extent of disease present and best type of surgery that is needed. In patients with PTC (papillary thyroid cancer) there is a risk of lymph node cancers as high as 30-50% at the time the diagnosis is made. These lymph nodes are measured best and assessed with neck ultrasound before surgery. It has been shown that recognizing neck lymph nodes with cancer before surgery and then treating with an appropriate operative resection lowers the risk of local recurrence (cancer coming back). It is the most effective means to decrease disease recurrence long term. Why is a neck ultrasound important for parathyroid disease? A neck ultrasound can help locate an abnormal parathyroid gland or even multiple glands. Locating these glands before any surgery is done can be helpful to the surgeon, and even allow for a more “minimally invasive” surgery if approporiate (a small scar surgery). Also, approximately 2/3rd of patients with parathyroid disease will also have thyroid nodules at the same time. It is important to address both the thyroid and parathyroid before any neck operation, as there is a chance necessary surgery may be done on both glands during the same operation. Dr. Brady and Dr. Sabra both perform preoperative neck ultrasounds when appropriate during the initial clinic visit.